We’ve all noticed service trucks, vans and occasionally an automobile around town with some sort of wrap advertising a company. Often these “rolling billboards” are a work of art. About 20 years ago, new technologies emerged and cheaper, better quality vinyl graphics made vehicle wraps much more affordable. For more on the history of vehicle wrapping click here. You might be asking “what does vehicle wrapping have to do with backflow enclosures?” You may be surprised to learn that wrapping has found its way into the waterworks industry. Recently, we've found a few backflow enclosures in the Nashville, TN area that have been wrapped. These enclosures no longer look like plain aluminum boxes, but instead contribute to the visual appeal of the building and surrounding area. 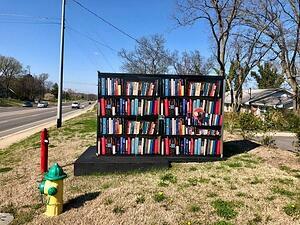 This is the most creative way we've learned to hide utility boxes. Take a look at each of these wrapped backflow enclosures. The first one below is at a grill and fireplace shop. This enclosure is near the front entrance of the building and not only advertises the store but is more visually appealing than an enclosure without a wrap. 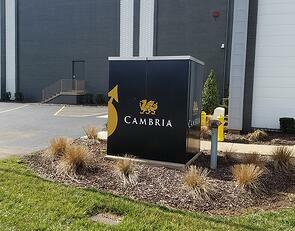 The next enclosure is at the front walk-in entrance of a building. This wrap is the logo of on a hotel chain and ties into the branding on the building. In the third picture, the wrap looks like a bookshelf. 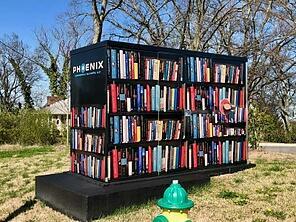 This beautiful enclosure is in the front lawn of a local area library. In each of these instances, the property owner was creative and used the wrapped enclosure to improve the aesthetics of their building and entrance. They made good use of this surface area to promote their company or service. We at Safe-T-Cover were curious about wrapping an equipment enclosure and did some investigation. Here's what we learned in an interview with Rich at The Wrap Lab in Nashville. What’s the process to wrap an equipment cover? The first step is the design and layout for the surface area of the enclosure. The Wrap Lab has a designer on staff to help the building owner with ideas to promote the brand, products, or services offered. The designer uses their creative talent to develop a concept of the design. Once the building owner is satisfied with the concept, a proof is created for approval. Once approved the vinyl goes into production. One creative but idea Rich tossed out was to wrap the enclosure to match the brick of the building, showing again that your imagination is the limit. Applying the wrap to the enclosure requires some prep work. The surface of the enclosure needs to be free of dirt and grease. Next the wrap is applied. Rich estimates that an enclosure 4’ wide x 8’ long x 6’ tall would take no more than 2 hours to install. One challenge Rich mentioned is wrapping outside as dust and temperature must be considered. What’s the cost to wrap an enclosure? We assumed the cost would be prohibitive but found just the opposite. Rich estimated the pricing for an enclosure 4' wide x 8' long x 6' tall for the wrap including installation would be somewhere in the range of $800 to $1,200. The wrap would even come with a warranty. The vinyl wrapping materials are made to withstand the impact of the sun but as we all well know, the sun is hard on surfaces. Rich suggested that a wrapped enclosure should still be looking good 7-8 years after it is installed. Rich shared an idea that would make sense for many enclosures. He suggested you sell the space on your equipment enclosure as advertising space, much like a billboard. He offered that vehicle wraps are intended to promote a company with the purpose of creating more awareness and ultimately more business. There's no reason why an enclosure situated on a busy street couldn't become an attractive source of revenue. We’re often asked about hiding utility boxes and backflow enclosures. Spending some time thinking through the location of the enclosure certainly helps. The use of landscaping often does a good job, as does choosing a color such as green for your enclosure. Now, you can even use a wrap to turn a shiny aluminum enclosure into a nice looking feature of the property. Search the web for a wrap company in your city to find out more about this unique and creative way to disguise a backflow enclosure.